Research led by investigators in veterinary and human medicine has identified genetic pathways that exacerbate severity of canine compulsive disorder in Doberman Pinschers, a discovery that could lead to better therapies for obsessive compulsive disorder (OCD) in people. The discovery appears in the International Journal of Applied Research in Veterinary Medicine. OCD is one of the world’s most common neuropsychiatric disorders, affecting an estimated 1 to 3 percent of people and listed by the World Health Organization as among the 20 most disabling diseases. OCD is often characterized by distressing thoughts and time-consuming, repetitive behaviors, while canine compulsions may include repetitive tail chasing, excessive grooming and flank and blanket sucking. Current OCD therapies are not as effective as they could be; medicinal treatment benefits only about half of all human patients. No previously recorded study in humans or dogs has addressed the factors that drive severity in OCD and CCD. “The cardiovascular systems of dogs and people are very similar,” said Pyle, a professor in OVC’s Department of Biomedical Sciences and a member of U of G’s Centre for Cardiovascular Investigations. In both dogs and people with DCM, the weakened heart muscle becomes unable to pump blood around the body. The cause of the problem is often unknown, although it’s common to involve genetics. DCM is the second leading cause of heart failure in dogs, and it’s especially common in large breeds. Dogs typically show no symptoms until the disease is well-advanced. For the study, Pyle and O’Sullivan, a clinical cardiologist in OVC’s Health Sciences Centre, worked with researchers at the University of Washington to test a novel therapy in diseased heart cells. “This suggests it’s a promising therapeutic approach worth further investigating for the treatment of DCM,” said O’Sullivan. One of 10 board-certified veterinary cardiologists in Canada, she runs OVC’s Doberman DCM screening program. The researchers also discovered some problems in the heart muscle that likely contribute to DCM. “This may shed light on the mechanical impairment in failing hearts,” Pyle said. Both researchers belong to U of G’s Centre for Cardiovascular Investigations, one of a few centres worldwide studying heart disease from single molecules to clinical applications. Paige Winkler, a doctoral student at the College of Veterinary Medicine, says that the researchers found a gene mutation that results in a missing protein responsible for the pigmentation of cells. 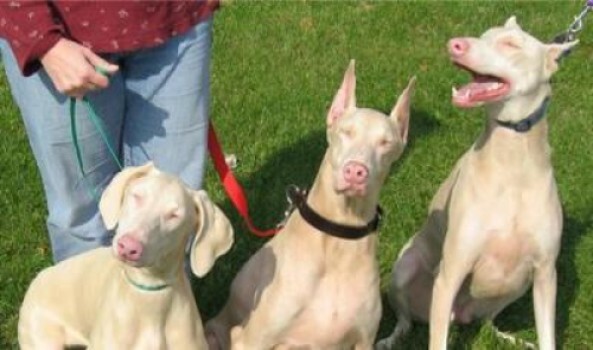 Albino Dobermans possess a pink nose, white or very light colored coats, and pale irises in the eyes. These characteristics are similar to human albinos who have light skin, eye discoloration and often experience visual problems. Like human albinos, the albino Dobermans are sensitive to light and have an increased risk of skin tumors. Winkler says that this discovery will help Doberman breeders in the future where breeding lines carrying the defective gene can be identified. The Riviera Hotel and Casino in Las Vegas is pet-friendly. Through discount site Coupaw, it is currently offering a 3-day/2-night stay for 2 adults at the Riviera Hotel and Casino in Las Vegas for $30. The voucher for this deal includes a Las Vegas BITE card which provides the cardholder with other excellent deals on a wide array of food and entertainment throughout Las Vegas. 2 Dog maximum – $25 additional fee – per dog/per night. 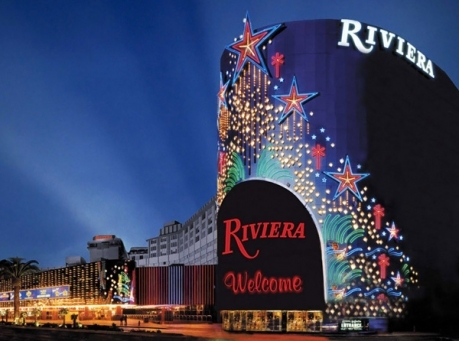 Pet fees are paid directly to the Riviera Hotel. All pet arrangements must be made directly with the Riviera Hotel. Pet friendly rooms are located in classic room types – San Remo tower. Dogs cannot exceed 50 lbs. Dog Owner must provide proof of current vaccinations including exhibiting current rabies tag on check in. Dogs that are excluded to stay in pet friendly rooms include but are not limited to: Akitas, Alaskan Malamutes, Chows, Doberman Pinschers, English Bull, Terriers, German Shepherds, Mastiffs, Pit Bulls, Presa, Canaries, Rottweiler, or any dog with a bite history. Coupaw is not responsible for the Riviera hotel refusing to accommodate specific dogs for any reason.